by Gary Bauer, Contributing Author: Every American feels terribly about the news coming from the Gulf Coast. Eleven men are presumed dead and their families and friends are grieving. 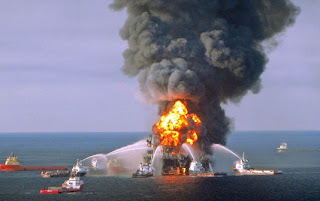 You don’t have to be an environmental extremist to be concerned about the damage done by the Deepwater Horizon spill – not only to the ecology of the region, but to the countless hardworking families who depend on various industries connected to fishing, seafood, tourism, etc. As always, Big Media is offering very little context, so we’ll provide the service that journalists should be. First, it should be noted that there are 4,000 oil and natural gas platforms in the Gulf of Mexico. The last major incident in the Gulf was 1979 – 31 years ago. That safety record is remarkable, especially when you consider how these platforms stood up to 200 mile-per-hour winds from Hurricanes Katrina and Rita in 2005. The Gulf of Mexico supplies 25% of all U.S. domestic oil production and 15% of natural gas production. If we ordered a shut down of drilling in the Gulf, gas prices would skyrocket and the economy would teeter on the brink because there’s no easy substitute for that oil. The folks trying to exploit this situation for a “green agenda” are engaged in demagoguery. We are an oil-based economy – a fact that is not going to change any time soon. Just consider this fact: All the assets being brought to bear in this containment and clean-up effort – aircraft for surveillance and chemical sprays, boats stringing barriers near sensitive areas – they all run on oil and gas. By the way, Barack Obama waited 11 days before he visited the region. Can you imagine if his name was “Bush” and what we would be hearing from the media about the out-of-touch president who didn’t care enough to make every federal resource available? Tags: Gary Bauer, Campaign for Working Families, Gulf Coast, Oil spill, To share or post to your site, click on "Post Link". Please mention / link to the ARRA News Service. Thanks!